The new road aims to reduce congestion and queuing through the centre of Penwortham, especially at peak times. Pic - Kevin Hunt. Work has begun on a new junction for the Penwortham Bypass in Liverpool Road. The new junction along the A59 Liverpool Road will help to reduce rush hour congestion and queueing traffic through the centre of Penwortham. Work begins today along Liverpool Road and commuters are being warned of likely delays as work is carried out. On Monday morning, (February 11), commuters were already battling with slow traffic from Liverpool Road Roundabout to The Fleece Inn, with one lane closed due to roadworks. The Penwortham Bypass, constructed by Lancashire County Council, is one of several major road schemes being funded through the £434m Preston, South Ribble and Lancashire City Deal. Upon completion in early 2020, the bypass is expected to carry approximately 22,000 vehicles per day. 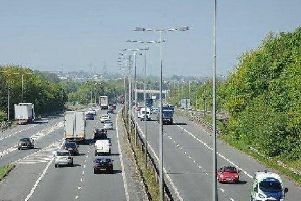 Traffic volumes on several surrounding roads, such as the A59, Lindle Lane and Pope Lane, are expected to reduce by 40 to 70 per cent during peak times. The Council is warning of possible disruption, especially to journeys into and out of Preston, as construction gets underway. But county councillor Geoff Driver CBE, leader of Lancashire County Council, said the disruption "will be worth it in the end"
He said: "A new road has been talked about for many years. Local people have put up with congestion for too long through the town, and I'm pleased that construction is going well and that the road will open next year. "Once the bypass opens, traffic will reduce in the centre of Penwortham and there'll be extra capacity on the road network. Upon completion in early 2020,the bypass is expected to carry approximately 22,000 vehicles per day. Pic - Kevin Hunt. "There'll be disruption while the road is being built, but it will be worth it in the end." From Monday, a temporary 30mph speed limit will be introduced for the duration of the works, in addition to lane closures in both directions along some sections of the A59, from Hutton Roundabout and Howick Moor Lane. The work will also include new pedestrian crossing facilities as part of the new junction. Councillor Margaret Smith, Leader of South Ribble Borough Council, added: “It is good to see the work on the Penwortham bypass progressing.